The conditions were perfect: Late season snow, followed by days of unusually warm temperatures, which were followed by another snowstorm. Experienced packers refused to head up the trail, due to the conditions, but many stampeders didn’t listen and carried their own supplies up the trail towards Canada. The avalanches started on 2 April. A small camp of 20 men was buried, but all were dug out alive. The snow really started to fall on Sunday, the third, which happened to be Palm Sunday. 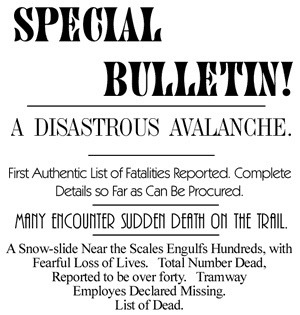 Mini avalanches rumbled from the mountain pass, so The Scales on the Chilkoot Trail were abandoned for the day. Roughly 150 men headed down the mountain pass towards Sheep Camp. Then the main avalanche hit. The avalanche swept down from above The Scales and headed towards Sheep Camp. When it came to a halt, it covered an area of 10 acres under 30-50 feet of snow. Stampeders raced up from Sheep Camp digging frantically for survivors. 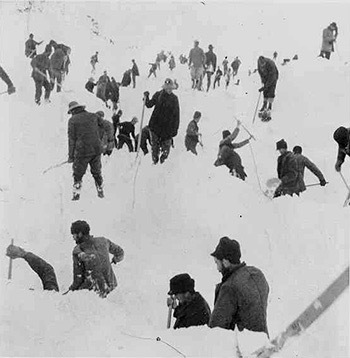 At least 65 men were killed by the avalanche, but that number is an estimate, considering the mad rush that was taking place on the Chilkoot to get to the Klondike gold fields. I hiked the Chilkoot Trail several years ago, and have written about that trek on here before. When I did that hike, one of the cameras I carried was an old Kodak No.2 Folding Cartridge. 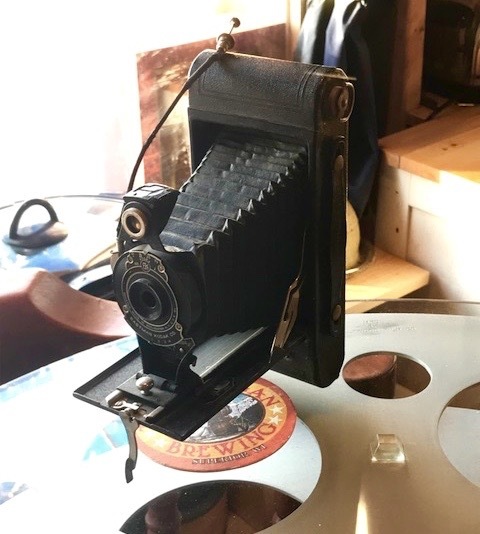 I thought it would be cool to carry a camera that was at least close to the era of the Klondike Stampede, even though this particular Kodak was manufactured around 20 years, or so, after the famed gold rush. There is very little left of the town of Dyea from its heyday. A few store fronts are propped up in the woods, and the old dock piers are still visible going out into the bay. 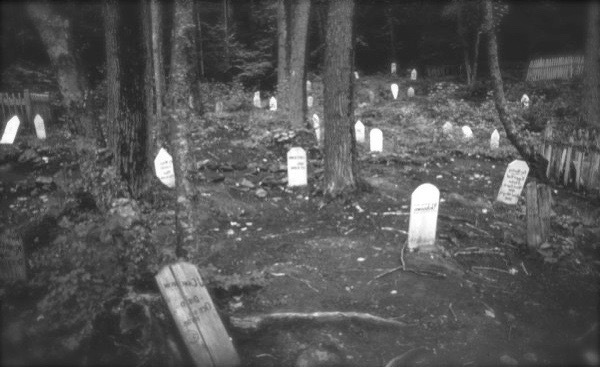 Dyea is also the location of the Slide Cemetery. All of the bodies that were found under the Palm Sunday Avalanche are buried here. I ventured out there with my cameras before I started on the hike. It’s an eerie place, which is only compounded by seeing the same date etched onto every grave marker: April 3, 1898. The air hung heavy, and the only sound that broke the silence was the click of my camera’s shutter. I was out there for quite some time, but I had the cemetery to myself; not one other person came by. 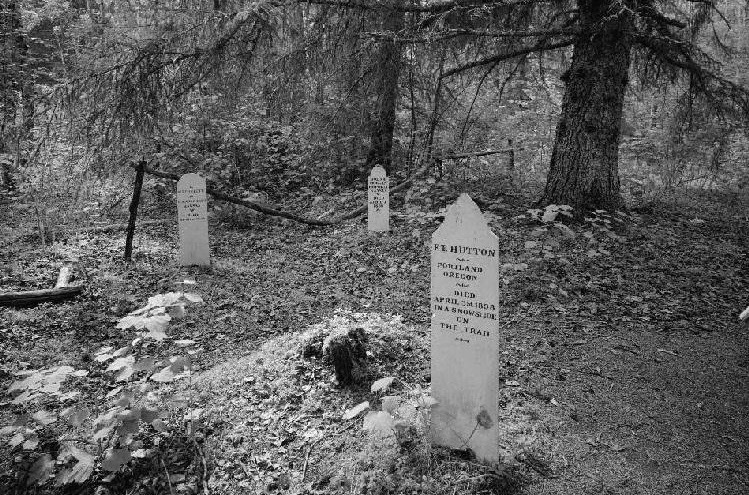 The cemetery is not layed out in neat rows; the grave markers are haphazardly scattered about, which makes complete sense considering its origins. Today, the forest is reclaiming much of the cemetery. I took the silence for an answer, clicked my final photograph, then left Dyea. Looking back at the print, I think the old Kodak did a great job of capturing the eerie feel of the cemetery that day.